The C.E.R.T. All-weather Field Operating Guide is the complete information resource for emergency response teams. 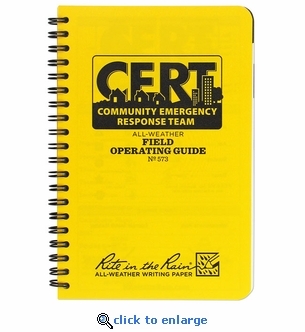 Developed by CERT trainers and volunteers from across the country, utilizing information from FEMA, this 96-page spiral bound guide is an important resource for all CERT participants. This is also a great reference guide to include in your home or office emergency preparedness kit. Printed on Rite in the Rain All-Weather paper, this field operating guide will hold up in all weather conditions.